ELECTION’ 12//HAYWARD SCHOOL BOARD//PROFILE | The students gather around the makeshift crime scene with yellow tape sectioning off students at the corners of the classroom with their papers and pencils at their finger tips. A plastic human body is spread out before them with the paraphernalia of a criminal surrounding the haggard corpse, cocaine, a bag of pills, a 9mm pistol and a bloodied knife. Their job is to measure the size of the crime scene, “West wall, 10 feet! East wall 10 feet!” shouts a student as he and his colleague snake around the makeshift murder scene. Students circling the crime scene frantically draw a visual representation of the unsolved case before them. John Taylor, Hayward school board candidate, walks from student to student to see how each of them is doing. Taylor’s forensics Eden Area ROP program won nationals last year and a new batch of kids working on the crime before them aim to do it again with Taylor at their side using the skills and experience he hopes to bring to the Hayward school board. In fact, ethics, integrity and honor are the pillars of both Taylor’s campaign and classroom, albeit with a dose of humor. “We have fun and laugh, but I try and implement a system of self correction.” Taylor gives his student;s the titles of captain, corporal and sergeant so when a student acts out their superior corrects them first. Every morning the students are even taken outside to do drills. When they forget formations or a timely about face, a student overseer of the exercise tells them to hit the floor for pushups. It’s not as militaristic as it sounds; no superior is screaming in a kid’s face, instead opting for positive reinforcement and repetition until the class gets the drill right. The style suits Taylor, though, who is demanding when he needs to be, but usually comical and warmhearted. 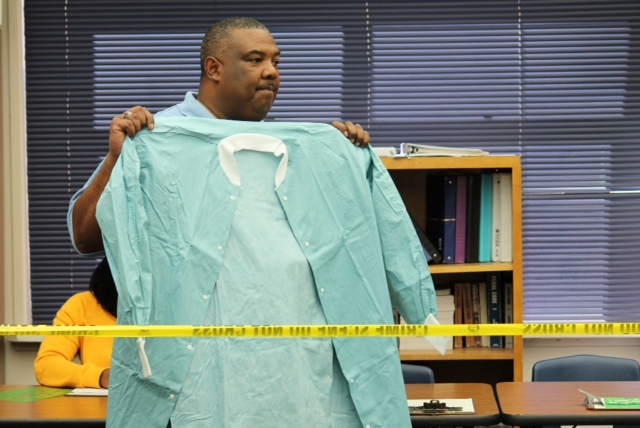 He was a police officer for San Francisco Police Department for 17 years where he practiced forensics. Influenced by a cop at his youth center when he was a boy, he wanted to grow up to be a boy in blue. He even ran his own security agency for years for different organizations around the country, even providing security at point for an event that Mike Tyson attended. That’s why Taylor emphasis public safety at forums, “A teacher can’t do their job if they are worried about their safety,” said Taylor. Posted in affair, Eden Area ROP, forensics, Hayward Chamber of Commerce, hayward school board, John Taylor, Luis Reynoso, Maribel Heredia, Sara Lamnin. Bookmark the permalink. Another weak candidate. I will not vote for anyone endorsed by the teachers union. And John is not strong enough to go against the district staff when you need to. Weak candidate that can't even speak. I have heard him on the board meetings when he praised the district staff for doing a good job and Mr. John Taylor will be a bad choice for me. 8:43, you, “heard him on the board meetings…” sounds like you cant speak either. 12:32 you write like John Taylor. …sounds like you CANT speak either…. Hey Tavares I just read the Oakland Tribune article endorsing Taylor, Walker and Reyes! These are nice people but I am disappointing and I believe that 2 of these people are just not qualified. So now the Tribune wants to replace a strong smart incumbent, just because the board is not getting along with a slate of feeble and inexperienced candidates. The tribune actually mentions they are not strong candidates! Hmmm… what does that mean? Poor opinion article. So why don't we know the reason the 2 other incumbents are not running? A complete bogus opinion and further gives credibility for me to vote for Dr. Reynoso only. In a time where I am paying more taxes levied through my real estate properties I need someone that knows what he is doing and is strong enough to take a stand for what matters to keep education working. My neighbors and I are just confused at the Oakland Tribune. 3:18 I read the OT story too and Taylor is qualified. I agree that Reynoso is a strong incumbent. Therefore, I think Taylor and Reynoso can work together. I will vote for Taylor and Reynoso. no on Taylor. he doesn't know what hevdoing. doesn't know school board business. I looked at his website and am disappointed by what I ready. none of the candidate are worth going to the polls for. can we start a recall? reynoso does not know what.the.f—. he is doing. He doesn't read his board packets, every single issue is “simple” to him, and he wastes time by interjecting his dime store wisdom at every opportunity. He has a chip on his shoulder the size of texas because he HAS BEEN FIRED FROM EVERY SCHOOL DISTRICT THAT HES WORKED AT…and no, it wasn't the economy, it wasn't budget cuts..it was his attitude and disregard, and refusal to give people the benefit of the doubt. He is disrespectful. He wants to be respected but look at him when staff or speakers are attempting to answer his question. He's looking down, googling, or trying to find whatever information that will support his “this is that simple, I can google it,” mentality. he's using the heredia/armas affair as a smokescreen for his own incompetence. Reynoso knows very well more than what he is doing and I will vote for him only. Good bye Jesus Armas and Maribel Heredia. John Taylor ( Having a teacher on the board is necessary I think, and he is much more like able than Annette and more competent than Williams or Reyes). This is my thought process. My opinion. That means I'm not wrong as these are my observations. So safe the trolling negative bs responses. I decided a long time ago to cast my vote for Dr. Luis Reynoso. So long, Armas. Be gone, Heredia. 9:58 Can't you blog without swearing? You sound like a very unhappy and mislead person. So sorry for you! Perhaps you should join Armas and Heredia and leave town. Who supplied you with all of that misinformation? Dr. Reynoso has more knowledge of education,schools and finance in his little finger than you have shown in your posting. You must be part of the “good ole boys” club of politics here in Hayward. Believe what some sour grapes idiot tells you is their mantra. It is because of Louis Reynoso that HUSD now has real bidding for contracts which means the district gets the most bang for its buck. It is because of Dr. Reynoso that high paid administrators are now going to have to do the job they were hired for, instead of farming it out to some consultant. You are a fool acting as a shill for Armas and his crew. I am sorry to burst the bubble that people that support John Taylor but I am convinced he is too much in the ignorance club to really understand education at the board level. I will not vote for Taylor. Nice guy but his inclination to be neutral on everything just makes him into a very weak candidate. I too heard him praising the executives of HUSD. All candidates for this year's election are horrible, including unprepared Reynoso! I too think Reynoso is using the Heredia/Armas affair as a smokescreen to his lack of knowledge and preparedness for board meetings. I have seen him picking up a board packet at the last minute to use for the meeting. Walker is on a power trip. Lamnin is part of the political machine. The only candidate who truly has proven that he cares about the children in our schools and holds the admin accountable for their misuse of public funds is Dr. Luis Reynoso. I appreciate his questions and the fact that the challenges the board and school leadership. Even EBCitizen states “This notion about “squabbling” at HUSD is nonsense. They're only reporting the surface and knocking the forces fighting for change.” Thank you EBCitizen! Thank you Dr. Reynoso! Dr. Reynoso has my vote!!! 7:14 No. It is Heredia who has testified that she does not read the agenda and backup materials before board meetings. You are very confused. Refer to EBCitizen: Hayward School Board Member Embroiled In Affair With Colleague Admitted To Not Reading Meeting Materials, Thursday, July 26, 2012 Steven Tavares. Read it, my friend! Walker does not need to be elected. She would be bad for Hayward. She doesn't come to any of the board meetings so why does she want to be on the board. Oh yea, a charter district. Ask her about it. She told me about it. Hey 7:14 did you ever hear when Reynoso said that he picks up all materials available to the audience to be sure the audience is getting what he board is getting? I don't think you know why he does that. BTW the board has the agenda materials on line that they get on their ipad. Don't vote for anyone supported by Jesus Armas & his “friend” Maribel Heredia. Armas wants to continue to hold on to power and continue his sneaky tactics. why is reynoso getting so much attention. I think reynoso writes all these blogs. Reynoso, you are a bitter paranoiac with napoleon syndrome. It's that simple. Reynoso is upset because he was a mediocre teacher, a mediocre husband, and a mediocre representative. He likes to point fingers and is always “disappointed” by one thing or another. I knew it I knew reynoso was that Moore guy in myword. So now the word is out reynoso is a contributing writer for this blog and he writes the responses to always make him look good. I knew it was him. I always wanted to know why so much attention on that guy. I think that reynoso also sent the flyer out to tell us not to vote for him because that will make people vote for him. reynoso wrote it too because he talks about missing meetings and we all know that heredia missed more so is just a reversed distraction to make us think that all politicians are against him. nice try reynoso but we caught you. 10:35pm, 1:50am, 10:03am Yes all of you are a very much paranoid idiots. I know Dr. Reynoso and he does not write any of these articles, and is not in cahoots with the writers, and he is not writing blog responses to articles either. This is plainly an example of how much fear Dr. Reynoso puts in the heart of the the corrupt political machine in Hayward. Reynoso has never contributed anything to this site and no, he did not make that anti-Reynoso flyer. If you pay attention and look at the bottom of the flyer it says it is from a PAC called “Good Government Now!” That's the Hayward Chamber of Commerce. 7:27 You are still an idiot! Believe me you, I am not Reynoso and I am going to vote for Reynoso because he can actually improve our failing schools. I decided to vote for Dr Reynoso when I began to watch HUSD School Board meetings a saw how badly Dr Reynoso and the public were treated by Armas, Heredia and Brunner. The students in Hayward schools have suffered at the hands of these three and monies have been spent away from the classroom instead of being spent in the classrooms. Why are these three to blame? Because they vote as a majority and do not consider the effect on students. The list of misappropriation of funds, hiring of family and friends, protecting admin instead of making them perform their duties continues to grow under the vote of Armas, Heredia and Brunner. Two down and 1 to go. You are next Brunner. For me and mine, we will vote for Dr Luis Reynoso. I am not voting for anyone that the teachers union or the chamber or the daily review endorsed…..
My name is Kathi Booth and I was a regular contributor to the HayWord, I did not post using a pseudonym and was very sorry that I chose to use my real name, because it set me up to be attacked over and over again. Who ever thinks that Dr. Reynoso posts as Michael Moore or anyone else on the old HayWord blog is just stupid!!! I have met Michael Moore and he does not resemble Dr. Reynoso in physical or philosophical form at all. In fact he has criticized Dr. Reynoso many times in the past. As for the other ObamaNewAge, that person was posting long before Dr. Reynoso was elected. I was a regular poster on the HayWord and can tell you that those who were brave enough to stand up to John Kyle used their real names. I hope that the entries that were posted here do not indicate that the EBCitizen will be taken over by sour grapes, uneducated, viscious people. We have decided to vote for Reynoso. His higher education expertise in finances, statistics and business ethics are needed to run the Hayward School District. 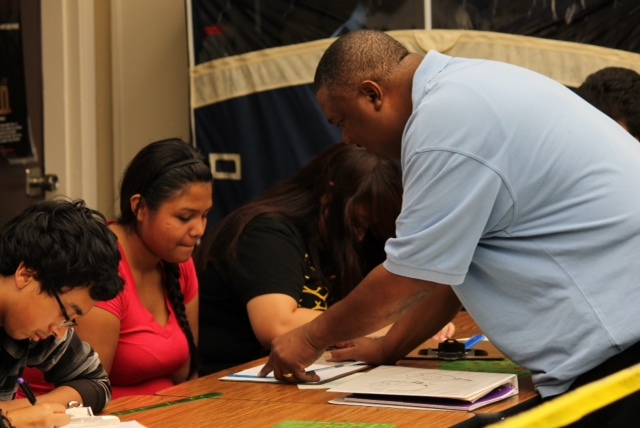 He has worked to improve fiscal and academic accountability in Hayward schools for 4 years. Vote for dedication and experience. Re-Elect Dr. Luis Reynoso for HUSD School Board. When is the next school board meeting?